You may hear on the news that a case is going to the Grand Jury and wonder, What exactly is a Grand Jury? Is a grand jury to same thing as a regular jury? Can does a grand jury have special powers that a regular jury doesn’t have? 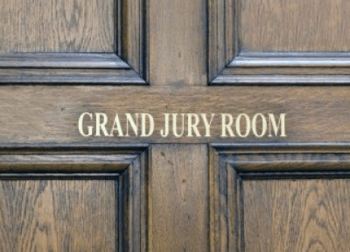 Where does a grand jury fit into my case? This article seeks to answer those questions and clear up some of the myths about grand juries in Texas. A grand jury is group of 12 citizens that review felony criminal charges to determines whether probable cause exists for the case to continue forward. This is NOT the same type of jury that hears the case at trial. The Grand Jury does not decide guilt or innocence, only probable cause. If the grand jurors determine that there is probable cause, then they vote to indict the case. An indictment is an essential part of every criminal case. If the grand jurors determine that there is not probable cause to believe an offense has been committed by the named defendant, then they vote to issue a no-bill. A no-bill typically means the case is dismissed and the District Attorney will not proceed with prosecution of the case. How are the Grand Jurors Selected to Serve? Prior to 2015, grand juries were chosen by “jury commissioner” appointed by district court judges. This process was known as the “pick-a-pal” system. The law changed in September 2015 and now grand jurors are selected in a random fashion, akin to the trial jury selection system. The jury pool is taken from registered voters in the county in which the court presides. Prospective jurors cannot have been convicted of any felony offense or a misdemeanor involving moral turpitude (like theft). They must also not have any criminal charges pending against them. An indictment is the formal accusation of a crime, issued by a grand jury. Prior to an indictment, the district attorney typically makes an allegation through a complaint. A complaint can become an indictment only after the grand jury votes to issue the indictment. Only an indicted felony case can proceed to trial (where the real jurors decide whether a defendant is guilty or not guilty). If a grand jury decides that a felony charge is not supported by probable cause, then it votes to return a no-bill on the case. This literally means that there was “no bill of indictment” issued. Sometimes, instead of a complete no-bill, a grand jury will indict a lesser-included charge, taking the felony to a misdemeanor. It is important to understand that the grand jury process is a secret proceeding. The defendant and his attorney do not have a right to be present in the hearing room or to present evidence unless the district attorney permits them to make a presentation. It is discretionary for the DA to allow either a paper submission or live testimony offered by the defense. During the grand jury hearing for a particular case an Assistant DA will explain the charge and the legal elements that the state is required to prove. The ADA will then run down the evidence from the police report and other video/audio recordings, giving the grand jurors a brief synopsis of the facts. The jurors can ask questions of the ADA and request further evidence if needed. In some cases, the ADA will call witnesses like police officers or victims to give testimony regarding the alleged offense. Most cases can be completed with the grand jury in a matter of hours, but the occasional complex case might take longer. 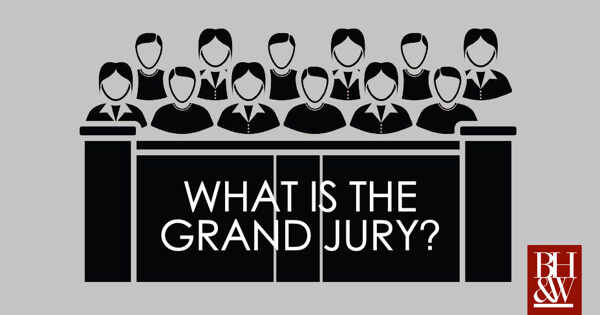 How is a Grand Jury Difference from a Regular Jury? The grand jurors serve a term (approximately three months), usually coming to the courthouse a couple of day each week. A regular jury comes for jury service and will only hear one case. A grand jury only hears a brief version of the facts from the side of the state while the regular trial jury will hear the full version of the facts from both sides as well as cross-examination of the witnesses. Grand jurors can only vote to indict or no-bill. They cannot find a person guilty or not guilty – only a trial jury can do that. So, in a sense, the trial jury actually has the “grand” power. Should the Defense Make a Grand Jury Presentation? In our experience, it can be incredibly helpful to make a defense presentation to the grand jury. This can mean the difference between a felony indictment, a misdemeanor lesser charge, or a complete dismissal. Sometimes the best presentation is a written presentation and other times the defense would be better served to address the grand jurors in person. It really depends on the case and the overall strategy of the defense team. Grand jurors like to ask questions, so being there to answer them is usually a good thing (if you have good explanations). Why is Johnny Football’s Case Going To The Grand Jury? Is it unusual for a misdemeanor case go to a grand jury? Simply put, YES. Most misdemeanor cases in Texas are charged by way of a document called an ”information.” An information does not have to be issued by a grand jury. The information can simply be prepared and reviewed by a District Attorney and then subsequently filed in a court with proper jurisdiction. Felony cases, on the other hand, must be indicted by a grand jury unless a defendant chooses to waive indictment and proceed without one. A grand jury in Texas is a group of 12 lay people qualified under the Texas Code of Criminal Procedure. These people must be citizens of the county in which the grand jury sits amongst other basic qualifications. Ultimately, the grand jury’s job is to listen to facts presented to them regarding the cases that they review and determine if probable cause exists for the State to continue forward to court. The grand jury does not have to be convinced beyond a reasonable doubt as to the person’s guilt; they simply need to determine whether it is probable that the person committed the alleged offense based on the facts and testimony presented. People often mistake a grand jury for a petit jury like they see in movies and television. 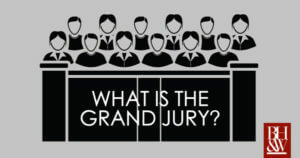 A grand jury is very different from the juries that hear and decide the final trial. During a grand jury proceeding, there are no arguing defense attorneys or heated opening and closing statements, and there is no judge that physically presides over the process. The grand jury meets together in private room with prosecutors and witnesses. A major distinction of the grand jury is that all grand jury proceedings are secret. The Texas code of criminal procedure clearly states that all grand jury proceedings “shall be secret.” Another basic distinction is that the grand jury is organized and run solely by the district attorney’s office. The grand jury is essentially a tool used by and for the district attorney. Why is Johnny Manziel’s Misdemeanor Allegation Going Before the Dallas Grand Jury? 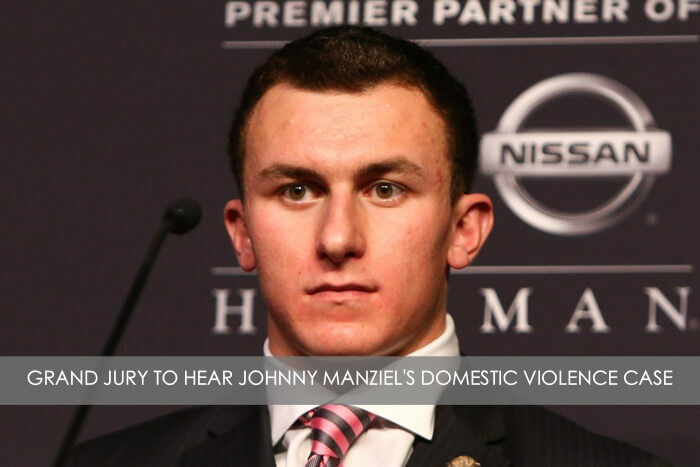 So – now that you know what a grand jury is and what they do – what does this mean for Johnny Football? If the filing of an “information” is the normal course of action for misdemeanor cases in Texas, why will Dallas County grand jurors review Johnny Manziel’s case tomorrow? That answer rests solely with the Dallas County District Attorney. We can only speculate as to why this may be. Manziel’s case is obviously high profile for Dallas. If the Dallas DA’s office were to take the case and simply file it with an information or not reject it without the review of the grand jury, they face scrutiny from both sides of the aisle. If they file the case, Manziel’s supporters would claim that the DA’s office is trying to unfairly make an example of his celebrity status and constant publicized antics. However, if they refuse to file the case, Manziel’s critics and domestic abuse activists might claim that his popularity, money, and status are unfairly allowing him out of another sticky situation. So, what better way to take the District Attorney’s name off of the ultimate decision than to let the Dallas County community – a.k.a. the grand jury – make it? More than likely this is precisely why, unlike most other misdemeanor cases in Dallas County, the grand jury will review Johnny Manziel’s case. Does this make Johnny Manziel’s Case a Felony? No. A grand jury can hear a misdemeanor case just like it can hear a felony case, we just do not see grand juries used for misdemeanor cases very often. If the grand jury votes to issue an indictment, Manziel only faces a misdemeanor charge for Assault (Bodily Injury) to a Family Member. This offense is a Class A misdmeanor which carries a punishment range of 0-365 days in county jail and a fine up to $4,000. Ultimately, this may just be the fairest way for the State to proceed and review Johnny Football’s case and precisely the right time to use the grand jury for a misdemeanor case. As a defense attorney, I wish all of my misdemeanor clients got the benefit of a grand jury review, but the volume of cases is just too high for the State to be expected to process all felonies and misdemeanors through a grand jury. The jury is still out on Johnny Football’s NFL career, but tomorrow the Dallas county grand jury gets to decide if even more juries lie ahead for this once seemingly-invincible Heisman Trophy winner. Is Johnny Manziel smarter than a ham sandwich? Years ago, I was employed as an assistant district attorney in a DA’s office out in West Texas. From time to time, I would oversee the grand jury and the presentation of felony cases for indictment. At the first of every month, the county would summon potential jurors from a random selection process to serve on the grand jury. The first fourteen (twelve to serve as grand jurors and two as alternates) who were not disqualified by statute were seated on the grand jury. Those fourteen citizens were always different. Different ethnicity. Different gender. Different religions. Different socio-economic status. Most importantly, different political parties. The goal was to create an impartial jury of peers to review the evidence in criminal cases and determine whether probable cause existed for indictment. You can imagine my surprise when I moved to the DFW area and discovered jurisdictions here which used the other method of selecting grand jurors. Article 19.01 of the Texas Code of Criminal Procedure allows the “pick a pal” method wherein judges can hand pick “jury commissioners” who individually select citizens to serve on the grand jury. As you can imagine, there has been a serious influence of politics on the grand jury process a result of this practice. It’s hard to have an impartial grand jury when everybody comes from the same political party and economic sector of society. Fortunately, House Bill 2150 was signed into law last month. On September 1, 2015, the “pick a pal” process will no longer be an option. Instead, the newly revised Article 19.01 will require all jurisdictions to apply the random selection process to the grand jury selection process. This change is long overdue. An accused’s right to an impartial jury should be the same at the grand jury as it is at trial.